From all across Canada, the role of libraries as civic anchors and cornerstone community institutions has been clearly established. Canadian librarians have loudly declared their commitment to Placemaking as a way of expanding and maximizing their limited facility and human resources; activating the public spaces that lie proximate to them; creating new and strengthening existing partnerships with other civic institutions, community organizations and city agencies; and contributing to the revitalization of their downtowns and civic centers. 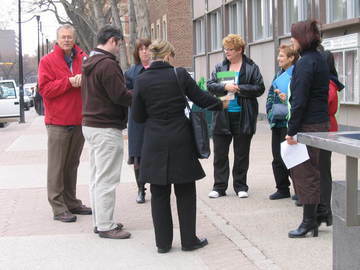 PPS has facilitated Placemaking training seminars for Canadian librarians that introduce participants to a unique, place-based approach to the planning and design of cities and towns and their public spaces. These seminars encourage library staff, directors, board members and facilities planners to think about their institutions in a new light and learn practical tools and techniques that they can use in applying these ideas. 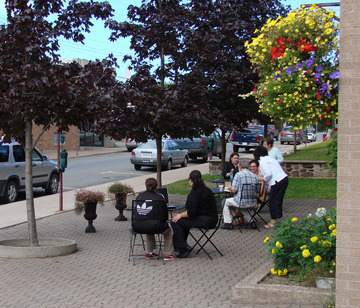 As a result of engaging in the training exercise, the New Glasgow library staff have taken over programming and management of the adjacent Laurie Peace Park, and put out tables, chairs, and landscaping every spring to encourage people to sit outside of their library, eat lunch and take advantage of the free wifi service.They have also partnered with their town planner, mayor and council on a variety of downtown reanimation and walkability efforts. In Regina, the Strategic Planner of the Regina Public Library understood that many of his facility needs could be handled by making better use of the public spaces located around the exterior of the library building and in the park across the street. The library staff and administration also played a key role in the development of a downtown redevelopment plan for the blocks surrounding the library. At the BCLA training in Richmond, BC, workshop participants generated innovative plans for the library including improving signage and pedestrian connections; making the exterior of their building more transparent to passersby; and programming both the park and the plaza in front of their building in cooperation with a sports facility.